With the twelve-volume series Feasting on the Word, Westminster John Knox Press offers one of the most extensive and well-respected resources for preaching on the market today. When complete, the twelve volumes will cover all of the Sundays in the three-year lectionary cycle, along with moveable occasions.The page layout is truly unique. For each lectionary text, preachers With the twelve-volume series Feasting on the Word, Westminster John Knox Press offers one of the most extensive and well-respected resources for preaching on the market today. When complete, the twelve volumes will cover all of the Sundays in the three-year lectionary cycle, along with moveable occasions.The page layout is truly unique. For each lectionary text, preachers will find brief essays --one each on the exegetical, theological, pastoral, and homiletical challenges of the text. Each volume will also contain an index of biblical passages so that nonlectionary preachers may make use of its contents. Very useful for sermon prep. This is not really a book you can say you "read," as it's more of a reference. I have it on Kindle, and I like it that way. 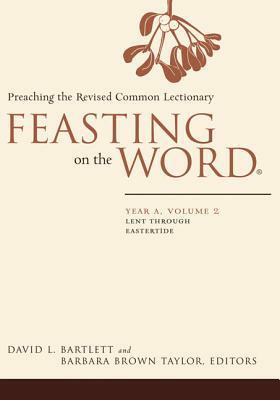 Great, thought-provoking commentary on lessons in the Revised Common Lectionary.